Among all the meagre offerings of the Wolfgang Reitherman era, The Jungle Book is often held up as the exception to the general rule. Coming at a time when Disney was playing it safe and looking to cut costs, its fans will argue that it is every bit as fun and entertaining as the classic films that preceded it. But while The Sword in the Stone gets a pass on entertainment value if nothing else, the same can't be said for this film, which more than anything else is shapeless and a little boring. This last remark will no doubt spawn a litany of angry voices, accusing me of sacrilege and taking things too seriously. Some may even go so far as saying that I shouldn't worry so much, since it's a children's film, and therefore not worthy of detailed analysis by me or anyone else. It's not intended to be a proper adaptation of Rudyard Kipling's novels, and if it succeeds in being fun then that is all that matters. I've already dealt with the "It's a children's film" argument in my review of Atlantis: The Lost Empire - in short, I disagree with it to the point of utmost contempt. As for the other arguments, I am just as capable of having fun as the next viewer - and I seek out fun in films more often than you might presume. I get no cruel pleasure from bashing Disney's weaker efforts, even when, as with Atlantis, I feel that I'm morally justified. On the contrary, I want every Disney film to be good, and when their highs are so high, it makes any low feel all the more disappointing. I've also made clear my reservations towards Reitherman as a director, and how the various shortcuts he makes within the animation more often than not compromise the quality of the film. In fact I've talked about it so much that the sensible thing would be to take it for granted, pointing any newcomers to my older reviews and moving on to something more interesting. Unfortunately, we need to address this a little more, since all the things I previously highlighted are in abundance in The Jungle Book. First and foremost, the reuse of footage from scene to scene is near-constant and completely blatant. 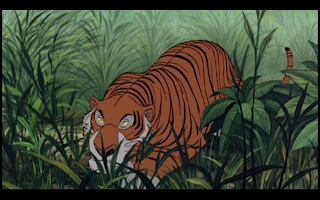 Bagheera's runs, Kaa's falls from the treetops, the marching elephants, even Shere Khan's head tilts - all of them are established at the characters' first appearance and then repeated without even the slightest attempt to cover it up. 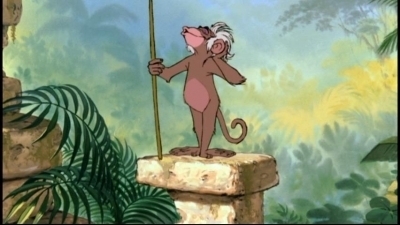 In The Sword in the Stone it was possible to forgive this, since the film was funny enough to make the rough edges feel charming, but here it's so obvious that it dents our ability to suspend disbelief. 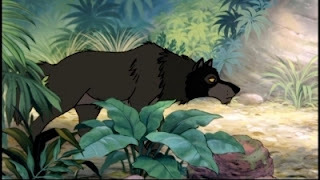 Like The Sword in the Stone, the animation is pale and scruffy, with the characters models having broad outlines and movement being much more in easily repeatable strokes than the movements in Sleeping Beauty or 101 Dalmatians. 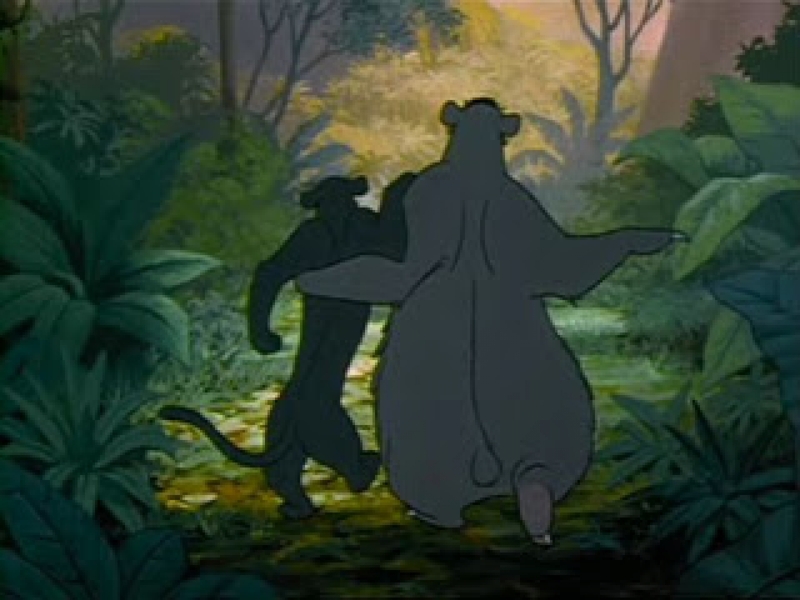 The colour scheme is very flat, with the Xeroxing technique lacking the bright, richly textured colours available to animators in the Technicolor era. And the film has a terrible tendency to shake the composition to hide where frames have been reused - a technique that's used far too often and doesn't work in throwing us off the scent. 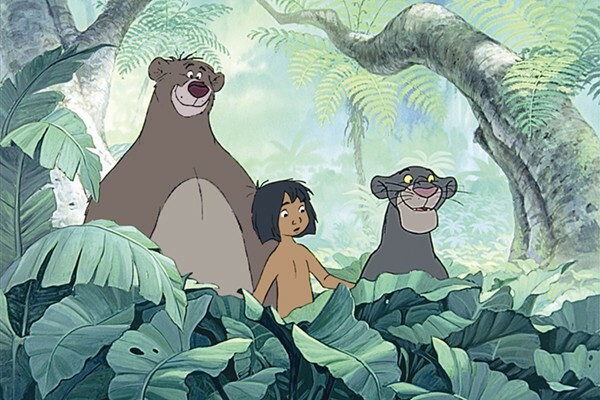 The next big disappointment with The Jungle Book is its story. Kipling's original stories are narratively interesting, being positioned somewhere between Aesop's Fables and early adventure stories like King Solomon's Mines (from which we eventually get Indiana Jones). They are also of historical significance, partly due to their context British Empire literature, but also due to their adoption by the early Boy Scout Movement. Even if not all the details of the stories were retained, stories of animals interacting with humans and exploring moral problems are always packed with potential. 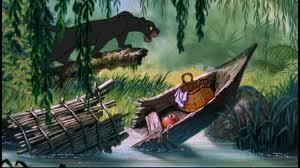 Unfortunately, the vast majority of Kipling's stories are either bowdlerised or completely disregarded by Disney. What we end up with is an anodyne road movie, with the plot revolving entirely around Mowgli's journey to the Man Village and the various characters he meets on his way. Aside from this being a lot less interesting than the original stories, it also gives us a film with more characters than the story has any use for, and that in turn makes what there is of a story feel baggy and drawn out. Because the original Jungle Book was a collection of short stories, any successful film version should either focus on one particular story, or else find some way of joining them together. 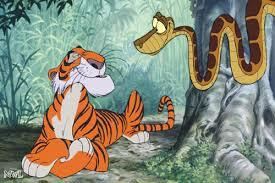 This version is mainly based in the first story, 'Mowgli's Brothers', adding in the encounters with Kaa from 'Kaa's Hunting'. But despite the best efforts of the writers (including Ken Anderson of Cinderella fame), it still feels like a series of episodes, in which characters turn up, do little and then disappear for quite a while. The only real up-side to this episodic quality is that it shows off the voice acting. The actors don't have a great deal to work with, or much room for manoeuvre, but some of the choices are still sublime. Phil Harris was a great choice to play Baloo, bringing his radio experience to the table and wringing the full potential out of most of his lines. Sterling Holloway is very good as Kaa, playing completely against type and adding the character's now-characteristic lisp. Best of all is George Sanders, playing entirely but thrillingly to type as the smarmy yet villainous Shere Khan. 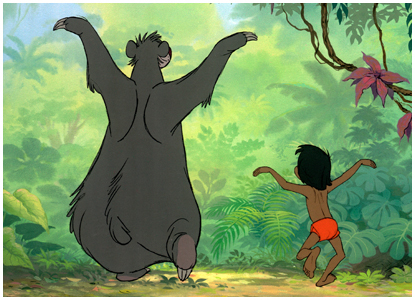 The music in The Jungle Book has become one of the main parts of its appeal. Admittedly it doesn't have much competition from within the Reitherman era - in fact, it's the last musical animated feature Disney made until Oliver & Company two decades later. 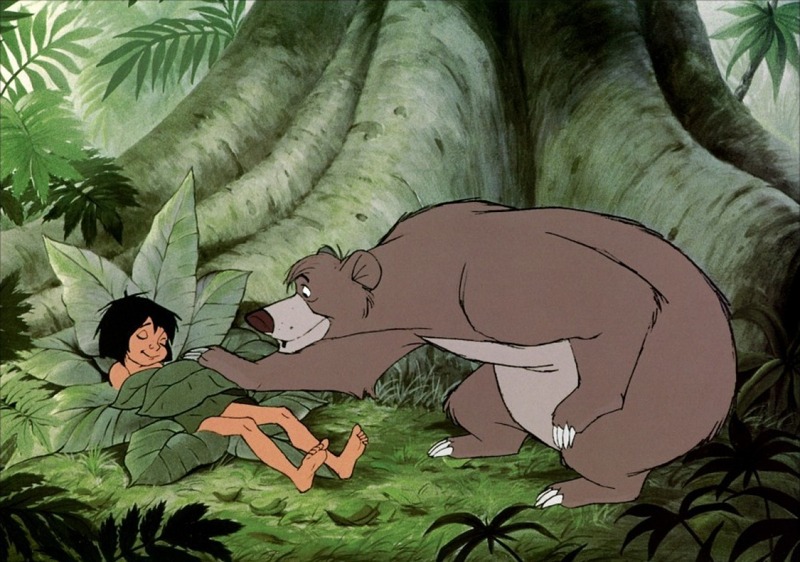 Some of the songs are perfectly fine, such as 'Bare Necessities' and 'Trust In Me', but even the best songs aren't as lyrically impressive or musically complex as we've come to expect. Neither 'My Own Home' or 'Colonel Hathi's March' are particularly memorable, while 'I Wan'na Be Like You' is just overrated. Disney has often been accused of sanitising darker works to avoid alienating younger audiences. Even beyond the narrative changes made, Reitherman consistently opts for a lighter, breezier tone, to such an extent that the moments that should be somewhat scary lack dramatic impact. 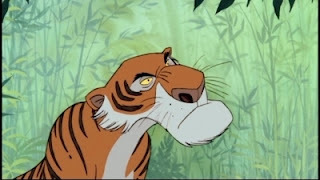 The final encounter between Mowgli and Shere Khan starts very well, when the characters are just talking with either silence or very minimal music. 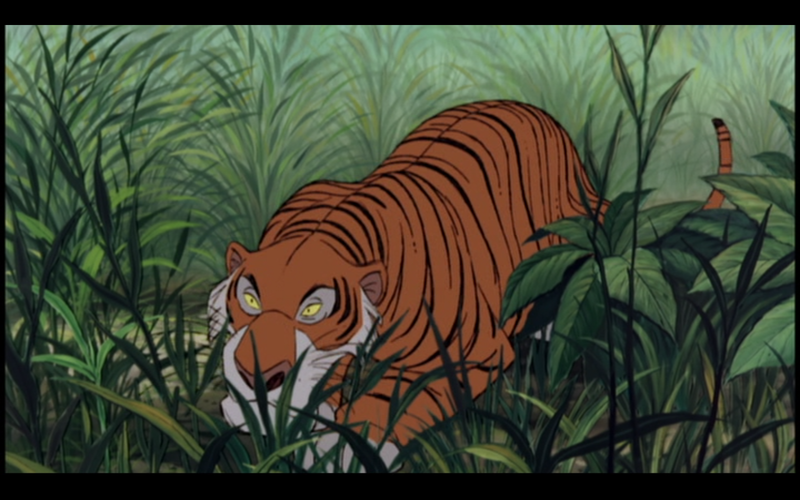 But as soon as George Bruns' jazzy score starts up, Khan becomes more of a joke. 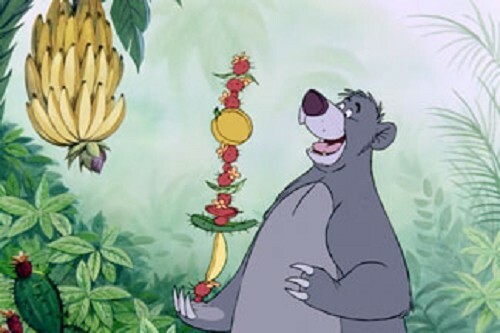 His comeuppance becomes a source of humour rather than a moment of catharsis, even with Baloo's predicament. The one aspect of The Jungle Book which has often attracted critical ire comes near the end, when Mowgli meets the young girl fetching water at the edge of the Man Village. Having never seen a girl before, he is instantly smitten and follows her singing into the village, never to return. 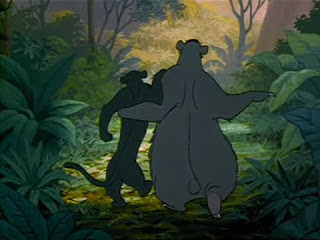 Baloo and Bagheera survey their man-cub's fate, then promptly dance off into the jungle as the film ends. At this juncture you might expect some kind of damning indictment of Disney sexism, sexualising this young girl by painting her as a siren. You'd have similar cause to complain that the monkeys in the film are racist, being voiced by black actors and depicted as lazy, thuggish layabouts. 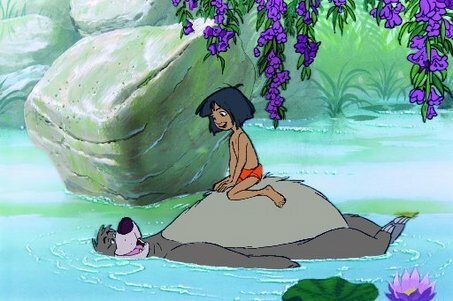 But ultimately The Jungle Book is too boring and innocuous to be worth getting upset about. It's too forgettable and flat to justify any emotion reaction beyond indifference - and that is perhaps the most damning criticism one can give. 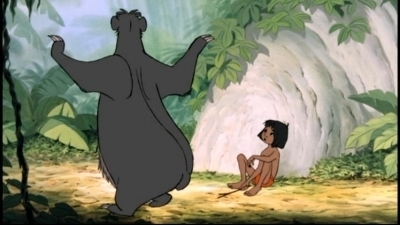 The Jungle Book is a big disappointment which fails to capture the life and lustre of both its source material and its predecessors. For all the good moments which find the actors sounding off well, or the odd decent musical number, it ultimately feels like a collection of bits which have no real reason to associate or progress to the chosen conclusion. 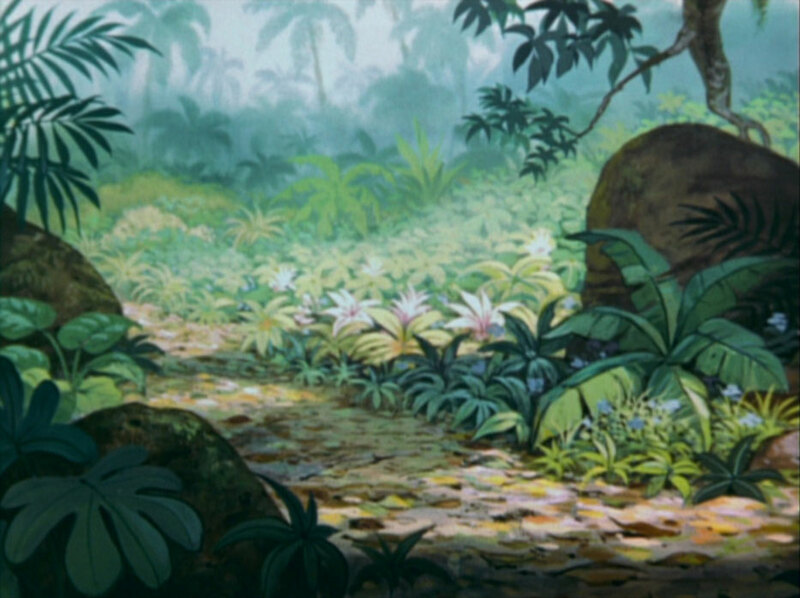 In short, it is indicative of the Disney wilderness years, being far too safe, far too pale, and far too boring.